As part of the Crossroads blog tour hosted by Late Bloomers Online, I got to interview Mary Ting, the author of the YA paranormal romance, Crossroads. Claudia Emerson has a good friend who shares the same first name and last name. That friend unfortunately dies in a tragic accident during homecoming dance. Claudia is distraught at the loss of her friend, but is even more disturbed by her dreams, which seem to take her to another place called Crossroads. Unknown to her, Crossroads is like a second heaven, a place between heaven and earth. It is where the souls of humans in comas or near death experiences may wander. Where, Claudia meets Michael, a nephilim, a half angel, half human, whom she often meets in her dreams. It turns out that this isn’t her first visit to Crossroads, which is an enigma for no human can ever travel there until Claudia. Now the fallen and demons are after her, suspecting she must be special and it is up to Michael and the other nephilims to protect her. Her dream becomes a nightmare as more secrets are revealed, about who she really is, and the true identities of the people she loves most. Can Michael fight his growing feelings for Claudia and protect her as a guardian angel should? With all the buzz in YA over vampires, werewolves, and witches (oh my!) why did you decide to write about angels? I decided to write about angels because of a dream I had in high school. I was on a road and to the left of me were tall grass or perhaps a cornfield. I was running, following a lady and I didn’t know why. She entered the tall grass and I followed her in. What I saw was breathtaking, a sea of clouds. At that moment, I knew I was somewhere spiritual. The lady turned to me, but I could not see her face. I only heard her voice telling me that it wasn’t my turn and that I needed to go back. Since Crossroads started from a dream, I wrote about angels. Also, I think angels are fascinating! 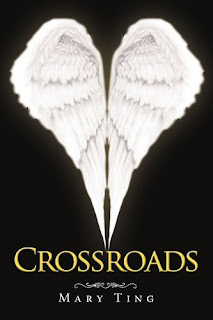 In Crossroads, you have some special kinds of angels⎯half-breeds called ‘alkins’. How did you come up with that idea? And how are your angels different than what people typically think? After Claudia crosses over Crossroads into Halo City, I wanted to create a love interest for her who was half angel, half human. They are called alkins. As Phillip describes it, they are the first generation of half angel and half human to be taken to Crossroads. These angels are different because they were born on Earth and taken to Crossroads as opposed to the typical angels who have been cast out from Heaven. Are there any interesting quirks you have when you write? Like, do you have to sit in a certain place with your computer angled just right, and a certain type of music playing? Or are you more of a free-floater? I can write several chapters in one sitting if I know what I want to write about, but before even doing so, I need to check my facebook, goodreads, blog site, and for sure my emails. Once I have done that, then I can feel free to start typing. Sometimes I eat candies, chocolates or ice cream to get me thinking, but I love Giant Chewy Sweet Tarts….Yum Yum!!! I can eat several packs in one sitting. Let’s get a little fun and funky now! :-) Create an acrostic poem with words that describe your book using the word CROSSROADS. OMW! – Oh My Wings! Can you tell us a bit about what happens in the sequel? And are there any other writing projects you’re working on that we should look out for in the near future? I’m currently working on the sequel. All I can say is that there are more angels on Earth. I have another series started, but it’s so difficult to find time to write now that I’m back to school, teaching. Maybe one day soon, I’ll get it done after the Crossroads series is completed. I love Mac computers, but since I own PC, I’ll have to say PC. This would have been perfect...if she said MAC! Loved the interview, and I have this on my wishlist. Sounds like a great read.